What is a bleeding colorant? Bleeding colorants are usually dyes or FD&C colors that tend to migrate into other layers of your soap over time (see picture below). Sometimes it can look super cool if you’re trying to blend your colors (a la tie dyed soap), but usually it just looks a little sloppy.For sharp, clean lines, pick from the list below! 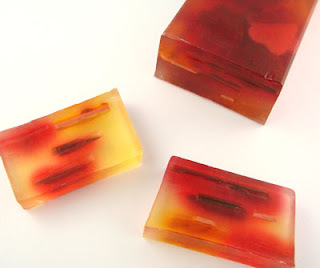 Want to learn how to make the soap above? Check out Soap Queen TV for a step by step tutorial! Hurry hurry and make some!! I need colors so bad and never know which ones to get. I like the non bleeding ones the best. Hurry and make a package of them and I'll be your first buyer! Angel Scents- We don't currently sell a pack of non-bleeding colors but I LOVE that idea. Keep you're eyes peeled for a kit in the future! I have such a hard time with colors. I would like to get all non bleeding colors in all colors in one big bag!! do you sell anything like that? Email [email protected] and she can get you a better shipping quote. It sounds like the shopping cart is defaulting to the most expensive method for you. I already checked at bramble berry, 1 oz cost will be $47 (more less). if I add Glycerin to my colorants will help ? I look for a Micas Kit at Bramble Berry, cause will be better order a Kit that just 1 oz. 😀 …? Welcome to the world of soap making! I am glad you have enjoyed the Soap Queen TV videos. They are a lot of work and but also a lot of fun to make! 2. True Colors is pure mineral make up so you could definitely use powdered pigments from them as soap colorant. You would need to experiment to find out which colors are bleeding and which are non-bleeding though! Though technically you could use any eye shadow, I'd avoid them (including MAC cosmetics) because their mineral make up is not pure mineral; it has added ingredients that dilute the product. If you are looking for micas that are non-bleeding any that you order from the list posted in this blog would work great for you. If the pricing from the supplier in Guatemala is high, please take a look at Bramble Berry, and see what the shipping would be, you can price that before ordering. What projects are you working on? I would love to help with something more specific. 1. The colors listed in this post- are they all non-bleeding. I just wanted to make perfectly sure that i understand. 2. Is it possible to use the cosmetic powdered pigments, such as the ones from MAC cosmetics or True Colors, for sprinkling or maybe swirling/marbling in soap? Thank you so much for your soapy wisdom! Thanks for this info. I just found a mica supplier here in Guatemala, but there are a quite expensive! 🙁 . I had been fighting with colorants that are solved in water. But they are bleeding and washed away. So now im trying some oil colors… [that´s my sad story..jeje] any help ? Yes, all of the colorants can be used in Hot Process Soapmaking. The oxides are really easy to use because what you see is what you get. So just add some until you get a color you like. Sorry I can't recommend a more specific amount – but the color varies so much based on what your recipe is in addition to the process you use that there are no absolute rules for colorants. Can the liquid, micas and oxides all be used in HP, if so at what rate? This list is so helpful. I'm printing it out and keeping it at hand for when I order again. Thanks! tie dye soap- fun concept. 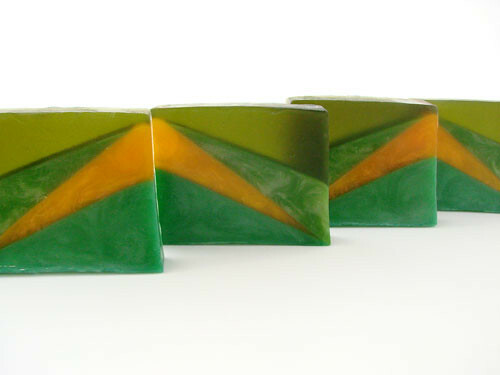 geometric soap though that is striking…. so much to learn! I picked up the non-bleeding red and the red jelly that you used in the Christmas candy soap and I love the color the combo creates and that it does not bleed. Will be using a lot of that for some Valentine soaps. in the sweet treat colorant set ..i love the rainbow jojoba beads..is there anyway you will be selling the rainbow jojoba beads in ounces?? without the whole set? i'm sorry anne-marie..i guess i read that they were non-bleeding, but i see that now thanks lol, as for the oxide i was referring to it is the Purple Oxide that is Limited Time only..that one is non-bleeding correct?? i love love brambleberry!! Maria, The jewelry box colorants do bleed because they are FD&C and water soluble. The description lists them as bleeding? https://www.brambleberry.com/Jewelry-Box-Soap-Colorants-P4563.aspx Maybe you were thinking of the awesome Sweet Treats Colorant set? That's a non-bleeding colorant scent. Angela, Vintage Grey – I'm off to hunt that down and figure out what's going on. I'll keep you posted. Maria, Purple/Violet Oxide is great – non bleeding. I'll add that. Thanks for your eagle eyes! Carol, I'm so glad that Stevie was able to help out. She's fabulous and we are lucky to have her. I'm brand new to soaping, so all of these tutorials help out a lot. Just today I got a nice response from Steve at Brambleberry about colors. also ..i forgot to ask what is the expiration date from day of purchase let's say today on your colorants and fragrances?? thankyou for this post..i noticed that in the oxides hyou didnt list the purple oxide..does that one migrate?? also i bought the soapylove jewelry colorants, and they say they dont bleed, but i made some soap with them and in a few days the colors migrated in both clear and white melt and pour..thanks!! I was wondering if you have any tips as to how to get your soap crystal clear. I love to embed soap into soap, but can't duplicate that truly glossy clear look that I've seen other people achieve. How do you do that??? Thanks for the info Anne! How come the Vintage Grey doesn't show under colorants on BB? If I click the link for Vintage Grey I see the bread crumbs Home :: Colorants :: Micas Sparkle/Cosmetic but if I just click Colorants, Micas Sparkle/Cosmetic isn't an option?